I got contacted about this event from our friends at SHARE Foundation and OSCE Mission to Serbia. Have a look and apply if you find it interesting. Netherlands with the OSCE Representative on Freedom of the Media. In a nutshell: ​ The Digital-born Media Carnival is a four-day event taking place in Kotor, Montenegro (14 - 18 July 2017) gathering more than a hundred representatives of online media, information explorers and digital rights enthusiasts pushing the boundaries of understanding of Internet freedom, business models and comprehensive distribution patterns of networked media. This event strives to provide a regional platform where the latest trends in the confluence of technology and society can be presented and discussed in a friendly environment with the aim to learn from each other. Through a mixture of interactive panels, talks, workshops and hands-on trainings, leading experts will give their take on the future challenges to the freedom of expression and media professionalism in a connected public sphere - how to create new opportunities for sustainability and growth while staying true to the ethical standards of journalism in a digital environment. 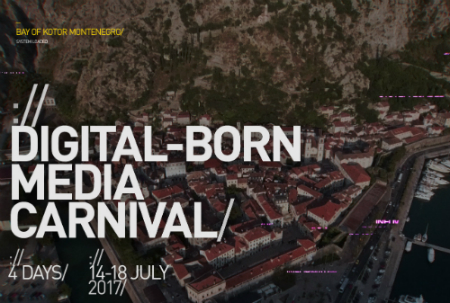 We are looking for ​ online media representatives, journalists, bloggers, content creators, human right defenders, hacktivists, new media startups ​ and others to join us for a four-day event in UNESCO world heritage site​ ​ Kotor. Individuals believing they could contribute and learn from others are welcome to apply, especially if they are coming from the Western Balkans, but others are also welcome. Together with 25+ international experts they will explore emerging opportunities and challenges in the digital media landscape within an environment designed to inspire, enable skill-building and provide a space for critical reflection. neutrality, targeted ads and privacy, innovation in reporting, data journalism, digital security, new media ethics, trust ​ and​ information quality​. The overall goal of this event is to provide knowledge on these topics and share experiences in a regional context. Also, the event will further strengthen the regional network of individuals and organisations dedicated to freedom of the Internet and their international counterparts to ensure continued joint action, innovation and learning in the field. A number of workshops and hands-on training activities will take place in the ​ mornings​ . the evening​ in venues in the Old City of Kotor and in the palaces of Dobrota. or who are willing to share expertise on these topics. ● manipulation and fake news. Apply for the carnival by 1st of June (Thursday). English will be the working language of all Carnival activities. However, a limited number of full and partial scholarships is available for participants who request assistance to cover travel and/or accommodation on a case-to-case basis. In the past, many participants in our events have received funds from their own organizations or sought funding from other sources. organisation or community you represent and envisaged role at the conference. You can ​access the ​online ​application form here​. Offline application to be sent via email can be downloaded here​. If you have any questions, please contact us via carnival (at) sharedefense.org. Hi Redon, thanks for sharing this, I sent it on to the debian-events-eu list and also submitted a proposal. I would potentially be able to visit Tirana again on the way to Kotor, does the hackerspace open during the summer? Happy to meet you again in Kotor. Can you make any suggestions for any developers who want to visit Albanian beaches during the summer? Do you have any Open Labs activities or social gatherings? or sleep in the shade during the day. @Members I’ve been informed that from 14 applications 8 have been approved from the organisers. It seems that it will be many of us there . I’m planning to stay two more days to enjoy the city. Let me know if more people are planning to do the same. @pocock we are planning for the second edition of FOSScamp Balkans, but this year we are moving to an island in Greece propably in early September. More details to be announce after we get more organized Would be great if you could join us. My topic was approved. I got a partial scholarship that doesn’t include transportation. @rskikuli thanks for the feedback. Do you know anything about where to stay in Kotor? Are the organizers making a group booking with a large hotel, or do people need to make bookings directly with the hotel of their choice? If we have to make our own bookings, it is really important to know where the conference venue will be so people can choose hotels nearby. Any update on the FOSScamp idea? Will you post that on debian-events-eu as well? I’m sure more people will want to come along. It wasn’t so long ago we had DebConf in the region and many people have good memories of that. five days. Does anybody know the exact day/time when it begins and ends? The description also mentions some venues are in the old town and the palaces of Dobrota (appears to be about 2km - 3km north). Does that mean it is best to stay in the old town, or how far out of the old town is feasible? Did anybody already book accommodation or receive recommendations about where to stay? The event starts at 14th evening and ends at 18th morning. @rskikuli do you know if they have published any recordings or photos from the event? I saw people making videos of the talks and I am keen to provide links to this content in my report for Debian. I was wondering the same @pocock because I was thinking of using them for a blog post as well. Will ask them and will keep you informed.